(OpenDemocracy) – Women’s ‘shocking’ participation in far-right politics has received much media attention. But is this a new trend, or have we been here before? Dozens of feature articles have recently marvelled at the increasingly female face of the far right in Europe and North America. The New York Times reported, for instance, on the increased visibility of women in the upper-echelons of far-right parties, from France to Norway. A Vogue feature described this as “the friendly face of right-wing politics,” and “an attempt to soften and feminise” the European far right’s extreme views. The core question posed by such pieces is: Why are women joining far-right movements? But we must also ask: Why are we so surprised? After all, these issues are not new. “What attracts women to far-right movements that appear to denigrate their rights? This question has vexed feminist scholars for decades,” is how one historian put it. The far right is often seen or assumed to be toxically masculine and a no-go zone for women. But the uncomfortable truth is that women also have a long history in far-right movements. 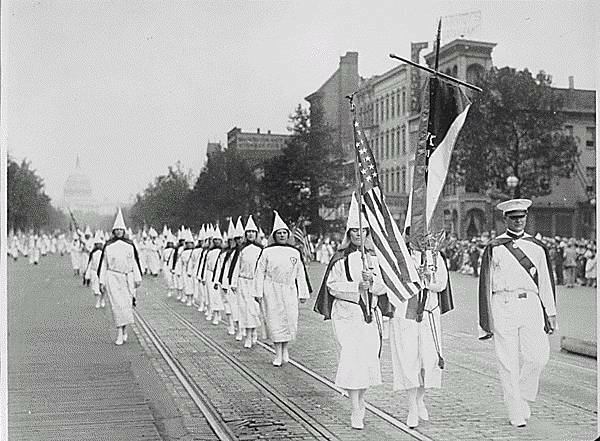 Women played key roles in white supremacist movements in the United States, for example, including as propagandists and figureheads. “There’s no reason to expect women to be less bigoted than men,” historian Linda Gordon concluded. Her research into the Klu Klux Klan (KKK) estimated that at least 1.5 million American women were members in the 1920s, including one third of all white Protestant women living in Indiana. “Women organised Klan rights of passage, baptisms, graduations, marriages and funerals,” Gordon said in a recent interview. Some women, who “may not have been vigilantes themselves, nevertheless, supported vigilantism.” she added. In the 1990s, US academic Glen Jeansonne wrote about far-right women in America during the second world war, and the so-called “mothers’ movement” which opposed US intervention but was not pacifist; its ideology was instead a mix of militant Christianity, anti-communism and anti-Semitism, he said. Twentieth century fascist movements in Europe were known for stressing women’s responsibilities at home. In Italy, conservative ideals of good Fascist mothers and wives were prominent in propaganda campaigns. Thousands of non-conforming women were locked in asylums for ‘moral deviancy’. In Germany, it was Kinder, Küche, and Kirche (children, kitchen, and church). Our history books are products of our societies too. Historians have also been influenced by “prevailing prejudices about the ‘apolitical’ nature of women,” and women’s supposed “predilection for the domestic sphere,” noted one academic. Has women’s participation been overlooked because researchers assumed they were just subjects, or ‘victims,’ of far-right regimes? “The common assumption [is] that fascism is a misogynist movement which has tended to exclude women,” according to researcher Martin Durham who contrasted this with cases of women’s active participation in fascist politics in France, Germany, Italy and the UK. 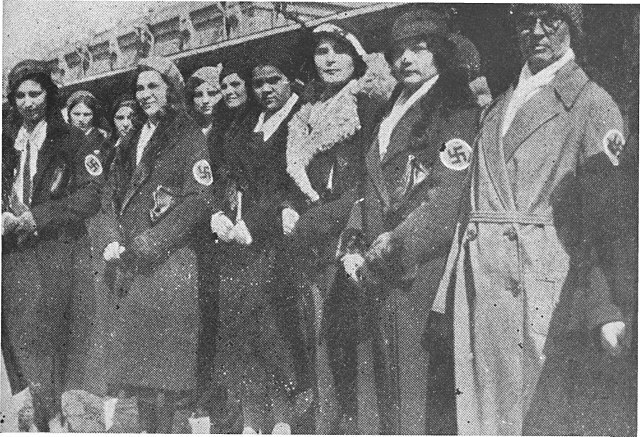 In Spain, the fascist Sección Femenina (SF) was “one of the most highly organised, mass women’s organisation in Spanish history,” and a “formidable political force,” said one account. Among other things it organised social assistance programmes and mass vaccination campaigns. The SF’s promoted an ‘ideal woman’ who was self-sacrificing and obedient to men, but it was also seen by some women as empowering as it recognised and respected their otherwise neglected labour caring for children and other relatives. In the 1960s, the SF also successfully lobbied for new legislation on women’s labour rights. In the UK, many historical reports also “overlooked the contribution of the women’s movement to Britain’s fascist experience,” and thus failed to examine how far some women went to support Oswald Mosley’s ‘blackshirts,’ notes academic Julie Gottlieb. Mosley’s movement even appealed to some former suffragettes. Though it has “traditionally been seen as predominantly an aggressively male movement,” there was “extensive participation of women,” said author Martin Pugh. “Fascism’s relationship with women has been neither consistent nor predictable,” is Durham’s conclusion. While men may have been more visible in such movments, large numbers of women also participated as voters, members, fundraisers, marchers, party officials, and more. Women’s participation in a range of political movements has been ignored or written out of history. “We’ve had many social justice movements… led by men. A lot of women have participated in those movements, however their work has never been recognised,” said Carmen Perez, one of the co-chairs of the Women’s March movement in the US. Can this help explain why we’re surprised at women’s participation in far-right politics? Could it be because we so rarely hear about women in radical politics, writ large? Meanwhile, what really motivates women to join such movements, and what do they gain out of their participation? We are asking such questions on 50.50, the openDemocracy section covering gender and sexuality, in a special series on women and the far right. This series is part of an openDemocracy partnership with the World Forum for Democracy, which in 2017 focused on populism. Series pieces include an in-depth feature on how the Italian media have helped the far-right group CasaPound to ‘glamourise’ fascism. 50.50 writer Claudia Torrisi looks at how the fascist movement is working to clean up its image and “build new political credibility” in the mainstream, ahead of this year’s national elections. The Italian media has been complicit in this process, she says. Isabel Marler and Macarena Aguilar meanwhile explored women’s participation in the growing Buddhist nationalist movement in Myanmar (also known as Burma), where 2017 military “clearance operations” killed thousands and displaced hundreds of thousands of Muslim Rohingya people. These actions have been denounced by the United Nations as ethnic cleansing. Movements are complex and comprised of many people who may have diverse motives. Women in Myanmar who have been marginalised at home and in powerful institutions may find empowerment and opportunities within the Buddhist nationalist movement that they don’t elsewhere. Female members have specifically referenced feminism as a reason for their participation. Globally, women’s rights advocates are warning that fundamentalists of diverse stripes are co-opting progressive language of rights and justice to pursue their own dangerous and divisive agendas. This includes movements which have used women’s rights used “to justify their hate-filled ideologies,” said Shareen Gokal at the Association for Women’s Rights in Development (AWID). Coming up soon on 50.50, journalist Niki Seth-Smith looks at the new documentary Golden Dawn Girls, which she says gives new voice to Greek women in the country’s far-right elite. “Women have been written out of history for their shocking contributions, as well as for their positive roles,” she says, while this film throws the spotlight on three women relatives of prominent Golden Dawn members. “Women’s roles in far-right and neo-Nazi groups have in the past been underestimated,” she writes. Reports may focus on movement leadership and parliamentary politics, for instance, or front-line acts of violence, while underplaying the importance of emotional and reproductive labour. When one of the Golden Dawn Girls tells her grandchildren “to go play with guns,” Seth-Smith notes that this is also performing a key role for the party. Globally, the rise of ultra-conservative, extremist, and far-right politics poses serious risks to women’s rights. This was the conclusion of a 2017 report from UN special rapporteur Karima Bennoune, which warned of growing “populist ultra-nationalism” that disregards key principles of equality, and the universality of human rights. We’ll publish a video interview with Shevchenko, followed by pieces exploring how ‘Army of God’ anti-abortion extremists in the US have been emboldened under Donald Trump’s presidency, and how Mexico City – which decriminalised abortion a decade ago – remains an island in a sea of anti-abortion states, while the right to choose is under threat here too. We’ll also examine how television and cinema have become ‘battlegrounds’ for a Christian right ‘spiritual war’ over gender roles and what ‘the family’ should look like, as part of our ongoing series tracking the backlash against sexual and reproductive rights. And we’ll ask: What is pushing, or pulling, young women in particular to far-right and ultra-conservative movements? Angry young women on the right are increasingly visible online, notably on YouTube, loudly rejecting progressive values. Twenty-two year old Laura Southern is among them; her videos on YouTube, presenting bigoted views on every conceivable topic, have been viewed millions of times. Southern also describes hating feminism, and her desire for a return to “traditional” values, yet she has been criticised as well from within her movement for not being married nor a mother herself. Recently, we met a number of young alt-right women in the UK, north London party to celebrate the one year anniversary of Trump’s inauguration as US president. They had different stories and political journeys. Some had higher education. Some were immigrants. Notably, several said their journeys had begun on the political left, changing course after feeling ignored or bullied. They rejected feminism flat-out, calling it hypocritical, unnecessary and even dangerous for casting women as victims, and men as predators. The atmosphere at the party was rebellious; many talked about the ‘right to offend’ and lashed out at so-called ‘political correctness.’ It was still a noticeably male-dominated event, however. Members of the white supremacist and anti-Muslim group Generation Identity were also present. Women are more active and visible in political life all over the world; perhaps it is not surprising at all that they are also represented in these movements too. The idea that women are naturally ‘peaceful,’ or less likely to espouse hateful or divisive views, is also an unhelpful stereotype. There is a huge amount of anger (and skilled, political acrobacy) on the far right – which translates into a huge amount of energy. We have been here before, and to dismiss these women, leave such trends unexamined, or reduce all women’s experiences to oversimplified, single story-lines, could be mistakes of historic proportions.